This versatile Collapsible Storage Bowls set is perfect for food prep and storage and will go just about anywhere. With three convenient storage bowl sizes they are great for taking in a lunch box, on a hike or camping. Pack along snacks in these 1.5 cup, 3 cup and 5 cup collapsible bowls with snap-on lids. Use Collapsible Storage Bowls to pack leftovers for lunch and reheat in the microwave. 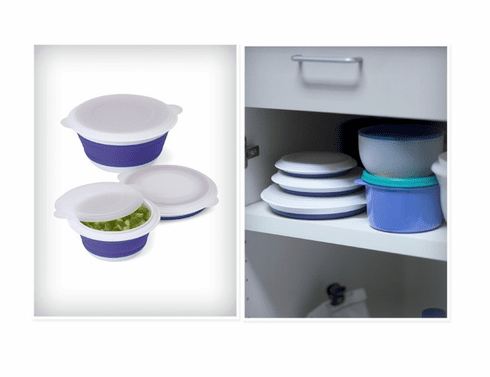 When done using, the storage bowls collapse down to 1/3 their original height for convenient storage in a drawer or cupboard. Microwave and freezer safe.